These are all mushrooms that can be identified easily from a photo, or a few simple tests. They are all mushrooms that you should be able to distinguish on sight after finding them a couple of times, this makes them relatively safe mushrooms for beginner to forage for. None of these mushrooms have poisonous lookalikes when mature, but you must still follow the rules I give in the article below for identification. So please read the article carefully about each mushroom, and the further information on them in our mushroom guide if you are considering eating anything you find. Details on habitat, season and more photos of each mushroom can be found in our mushroom guide. I have put these mushrooms in order of safest and easiest first, all are edible though some are tastier than others. The culinary rating is based on my own tastes, I have friends who think more of the Beefsteak fungus than I do for example, so please experiment with these mushrooms in your own way. For more details, photos and sometimes videos of the mushrooms click on the link to our mushroom guide below each one. We recommend novice foragers cook all wild mushrooms as only a few are safe to eat raw. You use the information in this page at your own risk. Never use this site alone for fungi identification purposes. Always cross reference your identifications with at least 3 reliable sources of fungi information. We will not be held responsible for stupid people who break the number 1 rule of foraging! NEVER EAT ANY WILD MUSHROOM OR PLANT UNLESS YOU ARE 100%SURE OF WHAT IT IS AND THAT IT IS EDIBLE. 99% SURE IS NOT ENOUGH! 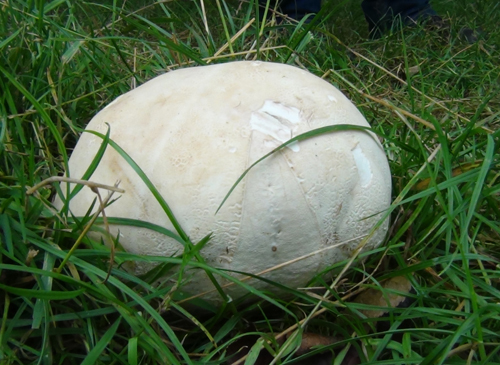 The Giant Puffball is the safest mushroom for anyone to forage in the UK. There is simply nothing else in nature, certainly not in the UK that grows into a foot wide white ball as shown in the photo above.When small and young they could be confused with other puffballs, or even Amanita or stinkhorn eggs. So only harvest when mature; that way you can be 100% sure you have an edible mushroom. This mushroom is very tasty, with a lovely strong mushroomy flavour but we don’t recommend just frying big slices of it in butter. If you do then the flavour is great but the texture lets the mushrooms down, it becomes floppy and can be a bit slimy.To get around this we recommend frying the mushroom then letting it cool a bit before dipping it in beaten egg, then some seasoned breadcrumbs. Then fry again until the breadcrumbs are crispy. What you are effectively making is a mushroom shnitzel or breaded mushroom. By adding the crunchy breadcrumb you get a lovely texture to go with the lovely flavour. For more details about the giant puffball in our wild mushroom guide, click here. The Hedgehog Fungus is another wild mushroom in the UK that we consider perfectly safe for even the novice forager. The spines under the white cap are unique in the UK, so if you have a white mushroom that looks like a hedgehog underneath; in the UK at least you can be 100% sure you have a hedgehog fungus.There are some other mushrooms in the UK that have spikes under the cap instead of gills or sponge, but none of the others are white.When harvesting the Hedgehog Fungus, scrape off the spines in the woods before you take them home. The spines are of very little culinary value, and by scraping them off in the woods you are potentially seeding more mushrooms. This mushroom is one of our favourites, they have a mushroomy flavour with a slightly nutty and sweet side.Ideal for use in any dish you would normally put a mushroom in. The texture is slightly firmer than normal supermarket mushrooms meaning you get more of a meaty bite from them in stews or pies. Beefsteak fungus or ox tongue fungus is aptly named. The brackets themselves look very much like ox tongue when growing as you can see above. Then when cut, not only does it have the marbling effect of an expensive bit of good Wagyu beef but it will actually bleed a thin red liquid!This mushroom grows from live trees, normally Oak and has no really similar lookalikes. Anything that looks remotely like this will normally be a hard, dry bracket whereas the beefsteak fungus is always maliable and moist. Looks can be decieving, it does not taste anything like good beef, it doesnt even really have a mushroomy flavour.Beefsteak fungus is quite acidic, with hints of citrus and it is not one of my personal favourites, I leave them behind more often than I pick them. Giving them a bath for a couple of hours in water and bicarbonate of soda gets rid of some of the acidity, but this is not something I have found to make them much better overall.Still it is a very safe and edible fungus, which I’m sure some of you experimental chefs could find a use for so if you do please let me know! 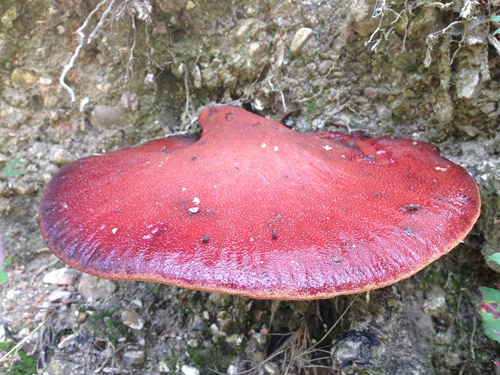 For more details about the beefsteak fungus in our wild mushroom guide click here. The Dryads Saddle is another very safe mushroom for the novice forager. It grows from dead standing wood and the cap can reach a metre in diameter, making it the largest capped mushroom we know of in the UK. It is easily discernable from similar polypore mushrooms as it has a very strong stout stem, rather than attaching to the tree like a bracket.The other thing that makes this mushroom very safe to identify is that it fruits in early summer through to late August, when not many other mushrooms are growing. This mushroom has a few culinary uses. It can be nibbled raw when young and soft, and quite surprisingly tastes of watermelon when you do. Frying them when young and soft is ok, the flavour is mildly mushroomy after cooking.Older specimens become very hard and woody, to support the weight of the massive cap, so at that stage frying them would end up with a very tough bit of practically inedible mushroom. We still harvest one or two big ones each year though. We then slice them and dry them at home, before powdering them with a pestle and mortar to make mushroom stock powder. The stock is quite mild but really suits tomato based curries. 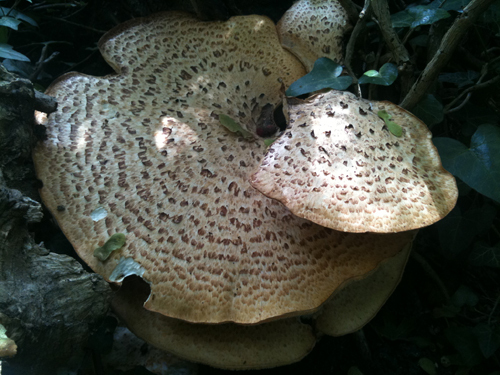 For more details about the dryads saddle in our wild mushroom guide click here. Identifying Wood Ears is easy, as long as you know what an Elder Tree looks like.These mushrooms grow almost exclusively on dead or broken Elder Trees. The safe part is that nothing else that looks anything like them will grow on an Elder. So if you see a mushroom like the ones above growing on an Elder, you can be sure you have a Wood Ear.A bonus with the wood ear is that it is the only edible mushroom you can be pretty sure of finding at any time of year. 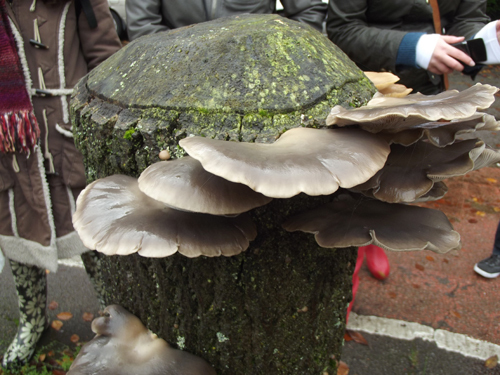 The picture above was taken around February, but the mushrooms will stay on the tree all through summer, drying out themselves before rehydrating when it rains. We tend to harvest them when dry on the tree, as that saves us the process of drying them ourselves when we get home. These mushrooms are used quite extensively in oriental cuisine, and hence can now be bought in most supermarkets. They are reasonably versatile and sometimes used fresh in soups and stir frys. Normally they are dried for storage and rehydrated by simply immersing them in liquid when it’s time for cooking. They only take a couple of minutes to rehydrate. Unfortunately the jelly like texture tends not to agree with western tastes. You can rehydrate them in whatever liquid you want to. Beef stock, chicken stock or even wine to enhance them with the flavour that best suits your dish. For some fun; because of the jelly like texture, you can re-hydrate them in orange juice, put them on a thin cake base and cover them in chocolate to make a mushroom Jaffa Cake :). 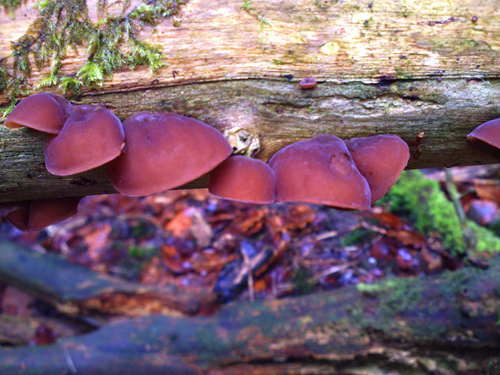 For more details about the wood ear in our wild mushroom guide click here. Slightly unexpectedly, these little cups have a lovely mushroomy flavour, and a reasonably firm texture. Lightly cooked they make a lovely colouful addition to any salad, but use them in any dish in a similar way to normal mushrooms, or cook them a bit more to use as a red mushroom garnish on top of a steak. 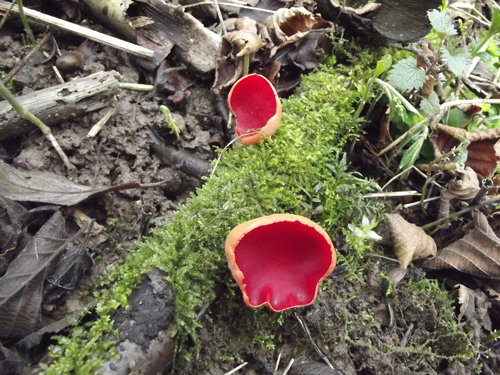 For more details about scarlet elf cups in our wild mushroom guide click here. You all know what a cauliflower looks like 🙂 This mushroom has a similar appearance, but don’t expect little white trees. I think the cauliflower fungus looks more like a pasta chef has had a very experimental afternoon! They will grow to a very large size as you can see from the picture above (Eric is a size 9 shoe).We have seen larger than this and heard stories of cauliflower fungus reaching over a metre in diameter, though I cannot confirm those. Like all the other mushrooms in this article we consider this a safe mushroom to pick once mature as at this size and colour with these pasta shell characteristics there is nothing you could mistake it for. When harvesting from a mushroom this size we only tend to take smaller sections rather than the whole thing. This is a really tasty mushroom, on a par with the Field Blewit in my opinion, but rated lower in the kitchen due to the preparation and cleaning process. I’m not particularly squeemish when it comes to the occasional maggot getting past me into the frying pan, but with these there are so many places for numerous different types of fauna to hide, you really have to be meticulous if you want to remove everything apart from the mushroom. That goes for any dirt, leaves or any other woodland detritus that the mushroom often grows around too.Once cleaned you have a lovely edible mushroom with an unusual texture. a bit like soft pasta. 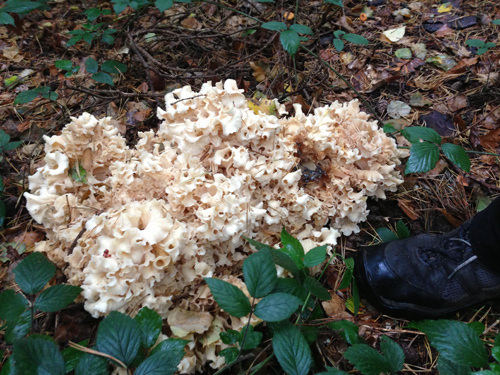 For more details about the cauliflower fungus in our wild mushroom guide click here. Field Blewits are a gourmet mushroom, much coveted by chefs, and available in most good French markets.As the name suggests, these mushrooms grow in grassy fields, they are also a late fruiting species, normally available from Late October and through November, often into December too. They are quite hardy and can take a reasonable frost, in fact they wait for the temperature to drop before fruiting, so a warm October is no good for them. Like many other grassland species they grow in rings. We have seen rings of Field Blewits over 25 feet in diameter.From the top they are a relatively non distinct mushroom, and can often be quite hard to spot, but once you have picked them the key identifying feature will become clear. The French call this mushroom ‘Pied Violet’ or violet foot, and a quick look at the picture above will show you why. Nothing else growing in rings in fields from November onwards will have this beatiful downy stem flushed with violet. Like most wild mushrooms, Field Blewits must be cooked before eating, if consumed raw you are likely to get a bit of a dicky tummy from them. These really are a lovely mushroomy flavoured mushroom though with a good firm texture if cooked properly. Much coveted by chefs all over Europe you would have to pay roughly 10 times as much for Field Blewits than for your normal button mushrooms if you are lucky enough to find them on sale anywhere in the UK. Whether they are 10 times as tasty I have my doubts, but you can decide that for yourself when you find them :). They do tend to hold a lot of water so when frying fresh from the forage you may need to keep removing the water from your frying pan for a while in the early stages of cooking unless you want slightly stewed mushrooms, keep the water though as it is lovely mushroomy stock to use later. For more details about the field blewit in our wild mushroom guide click here. I’ve really been toying with whether this is an 8 or a 9, and I have decided upon an 9. My dilemma is based on the fact that people have been known to poison themselves in the past thinking they were picking Penny Buns. I still believe they are a very safe mushroom to pick though; as long as you follow some simple rules.The Penny Bun mushroom is in the boletus family of mushrooms. That means that under the cap it has a sponge; it doesn’t have gills; ever, so if you have found a mushroom with gills it is not a Penny Bun, no matter how much you want it to be! I emphasize this point because the poisonings I have heard of involved people eating gilled mushrooms thinking they were Penny Buns.So you are looking for a mushroom similar to the picture above, with sponge under the cap instead of gills. Make sure you can confirm this so don’t pick young specemins where the cap is not open yet. There will be no skirt on the stem of the Penny Bun, but as you can see from the photo above there is a webbing effect on the white stem near to where it meets the cap. This web effect is white over a slightly darker background with the Penny Bun and slightly darker on a lighter background for the Bitter Bolete (see below). With the Penny Bun the sponge will be white, the flesh will be white, the stem will be white, and the cap will start whitish when very young, quickly becoming brown as it matures. When cut the flesh will not stain any colour at all. One mushroom that can pass these tests is the Bitter Bolete, but don’t worry it isn’t poisonous, it just tastes awful. Apart from that if you follow the rules above you should only ever pick a Penny Bun! This and other members of the Boletus family are my personal favourite mushrooms to eat in any way. The texture and taste are both lovely fresh and can be used in the same way as any normal mushroom. Generally when you buy Penny Buns, or Porcini as they are known in the shops; you buy them dried for soups or stew type dishes. The process of drying not only means that you can keep them for a very long time but also enhances the flavour. You can rehydrate the mushrooms before cooking if you want to but as long as there is plenty of liquid in whatever you are cooking, there is actually no need as they will re-hydrate through the cooking process. Therefore to me the most important thing to know about Penny Buns is how to dry them. We favour the air drying method (unless you have a dehydrator handy). Simply cut the mushrooms to about half centimeter slices, put them on a wire rack or anything else that will let the air circulate around them and point a fan at them until they are dry. This preserves all the fresh flavour. If you place them on paper to dry some may well stick so if that’s what you do make sure you keep turning them. 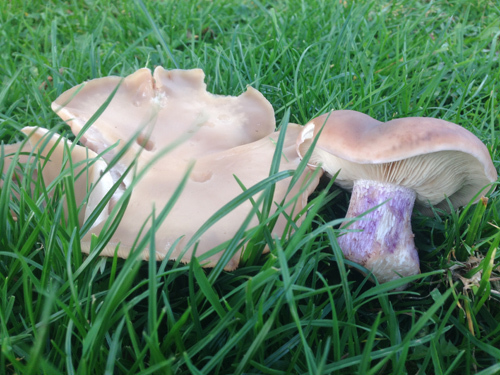 For more details about penny buns in our wild mushroom guide click here. Oyster Mushrooms get their name because of the wavy oyster shell like edge to the caps of the mature specimens, as you can see in the photo above. At this stage we consider them 100% safe for the novice forager.When young there are some lookalikes for the Oyster mushroom that you don’t really want to eat. None are deadly though. 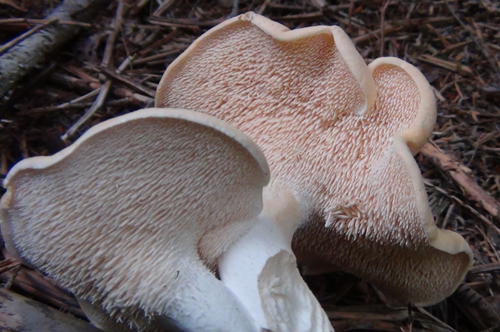 Most notably the oysterling which looks very similar to a young oyster mushroom. So for the novice forager we recommend only harvesting mature specimens with a cap of over 10cm in diameter. That way you will be 100% safe if the mushroom has the following features.Though they don’t look like it in the photo above Oyster mushrooms attach to the wood they are growing from with a stem. They grow from almost any type of dead wood, we have even seen them growing from skirting boards. They are a gilled mushroom, not a polypore. So if there is anything apart from gills under the cap, it’s not an oyster mushroom. Those gills are its last key identifier, they run down the stem very far, often all the way to the wood the mushroom is growing from. The photo above is of the grey version, there are also white and sometimes even yellow and pink versions in the UK too. Size matters with all of them though, so if you find a small one, leave it and go back a couple of days later to see how big it has got. After a while you will probably be confident picking younger specimens too, but if you stick to the big ones early on you will be ruling out any mistakes. Interestingly these mushrooms are about the easiest to cultivate in the world, as they grow from almost any substrate. If you are a mushroom fan you have probably used oyster mushrooms already as they are one of the most widely available in shops. This is due to how easy they are to cultivate. They keep their texture quite well in most dishes, but cook them ‘The Irish Way’ a bit first to firm them up and you get some nice meaty mushroom chunks in any pie or stew. The Irish way is basically baked on a low heat after smothering in butter and seasoning :). For more details about oyster mushrooms in our wild mushroom guide click here. What about sulphur shelf aka chicken of the woods? Is this easy to mistake for something else? If I sent photo. Could you identify as oyster. .? Thank you. 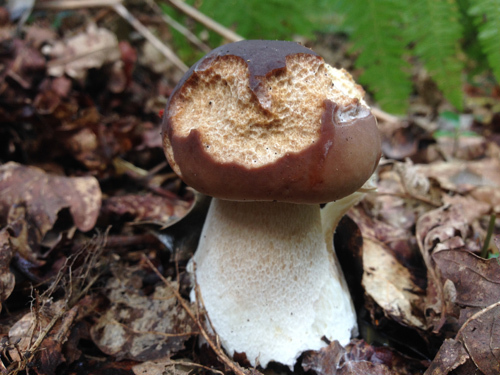 Hi Jac, if you email some photos to admin@widfooduk.com we will take a look and let you know what mushroom we think you have. We can never be 100% from photos alone though. 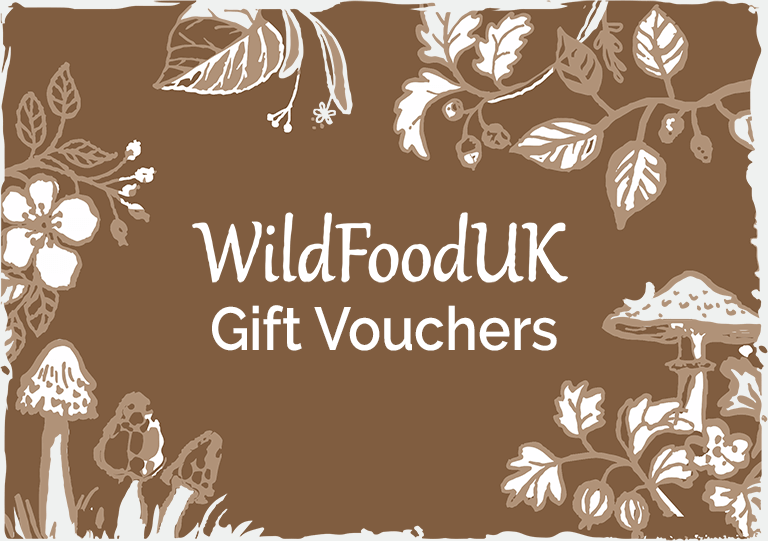 If you send some pictures to admin@wildfooduk.com then we can take a look and let you know what we think it is. We can never be 100% sure from photos alone but we can point you in the right direction.